Sheela Bhatt/Rediff.com reveals what Gujarat Chief Minister Anandiben Patel is really like. There is a beautifully evolved phase in Anandiben Patel's past. In 1998, then chief minister Keshubhai Patel was losing his grip over Gujarat due to various issues, including interference in administration by his family members. Then, Narendra Modi had a dream. At that time he was camping in New Delhi and living in the outhouse of Arun Jaitley's sarkari bungalow at 9, Ashoka Road, or he lived off Janpath in the government-allotted house of Dilip Sanghani, then a Bharatiya Janata Party member of Parliament from Amreli, Saurashtra. Believe it or not, Modi, who ruled Gujarat for 13 years as chief minister, initially wanted Anandiben Patel to gather courage to dream big and aim for the chief minister's chair. Modi was then a kingmaker and not someone who could be king. He was more a backroom boy, a pracharak who understood realpolitik that could launch political careers. Much later, he scripted the coup against Keshubhai Patel with Jaitley's help and convinced then prime minister Atal Bihari Vajpayee to become chief minister himself in 2001. Anandiben is a woman of few words who rarely smiles. Nobody has seen her laugh. She is the longest serving minister in Gujarat's BJP government. She flaunts 16 years of continuous experience as minister. Her ultra-luxurious home in Shilaj in Ahmedabad is testimony to her successful career as a politician of the ruling party. Patel has always been the virtual No 2 in the cabinet after Modi and the only minister who can call secretaries of other departments to discuss government issues. A former school principal, Patel's association with Modi goes back to the early 1980s when Modi was a Rashtriya Swayamsevak Sangh pracharak. She was much more stable than Modi and gave him rock solid support when he was bustling with ideas, plots and plans. Subsequently, when Modi became general secretary of the Gujarat BJP, he was instrumental in getting a Rajya Sabha berth for Anandiben. Patel was elected to the state assembly in 1998 from Mandal constituency in Ahmedabad district and subsequently shifted to Patan in North Gujarat. In the 2012 assembly polls, Patel shifted to Ghatlodia in Ahmedabad city. Besides her ministerial responsibilities, she is also in charge of the BJP organisation in Ahmedabad city and Surat district, both saffron bastions. "She virtually controls the Ahmedabad municipal corporation and also the BJP in the city and district," a BJP worker said. Known to be hardworking, Patel is a strict taskmaster and gets maximum work out of bureaucrats and others. She is accepted much less among party cadres, but the bureaucrats in Gujarat generally bow to her dictates. In charisma, she is not a patch on Modi, and her acceptance among the masses will never become a reality. Still, she is not a bad choice from the available options the BJP and Modi have in Gujarat. Count this: She is a woman; she is a Patel, the dominant caste; she is highly educated; she has experience; she is loyal to the party; and she will work hard under her mentor Modi's watch from New Delhi. If Modi had selected Ganpat Vasava or Bhupindersngh Chudasama instead of Anandiben or any other Patel minister, it would have hurt the Congress deeply. In the tribal areas of Gujarat, the Congress definitely has its strong presence. But for the last three decades with or without Modi the Patel lobby has dominated the power set-up in Gandhinagar. Their social and economical upward mobility allows them to dictate political decisions. In that sense Anandiben's appointment will turn out to be a smooth decision. There have been negative reports about her handling of the education department. Under her tenure Gujarat's education has not only become costly, even its quality has deteriorated. The self-financing schools have become a menace to society and corruption is taking its toll on the management of schools and colleges. For BJP and Congress MLAs the most lucrative business has been to make money out of the 'education industry'. On Modi's instructions, for the last two years Anandiben has been travelling widely in the state to get a sense of the district-level political and administrative scenario. She has met collectors and various important government officials to get a grip on issues. She trusts Modi and would not do anything without his knowledge or consulting him. Modi too has complete faith in her. Emphasis should be placed on the word 'complete'. People who know her temper say she is a "Patlani", meaning she has in her what all goes with the womenfolk of the Patel community. In Gujarati folk tales, Mrs Patel is usually a sturdy woman, has more grit than the men of the family, they dominate without showing off, and run for a long course in life. Above all, they have tremendous tolerance. Anyone who has studied Indian-American success stories in business and in general would know how the Patels have made it big. It is actually Mrs Patel Power. The power to toil, to dream big and to accumulate wealth to shape their children's future has had a tremendous impact on America. 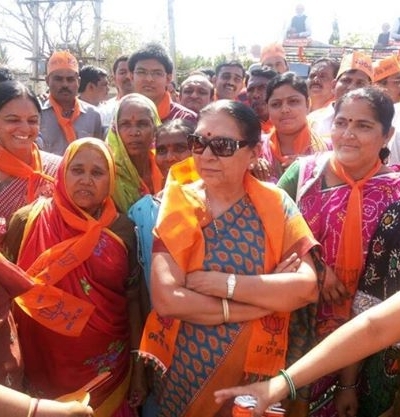 Anandiben is no different from what Gujarat social legends says about Patel woman power. A deserving Patlani has entered the history books. Image: Anandiben Patel. Photograph: Courtesy Anandiben Patel's Facebook page. Who will succeed Modi if he goes to Delhi?